Cranberries – most of us either love ‘em or hate ‘em, as their strong, sweet, yet tart flavor have such a specific bold taste that it can simply be too much for some folks. Me? Well I grew up in Massachusetts, with summers at Cape Cod, which means Ocean Spray was not too far down the street and stocked heavily the local supermarkets. I also had a friend whose mother worked at Ocean Spray for awhile, and she would get these cases of “mistakes” – which were mislabeled Ocean Spray cranberry mix drink cans. So when you drank one, it was like a daring roll-the-dice like adventure. Cran-Apple? Cran-Grape? Cran-Raspberry? You never knew. But I liked them all. The question for me here is – does the bold flavor of Cranberry go with BBQ sauce? I’ve already given Big Butz Classic Cranberry BBQ Sauce a 5 star rating, much because the cranberry flavor was so light and so subtle. Just nicely done. 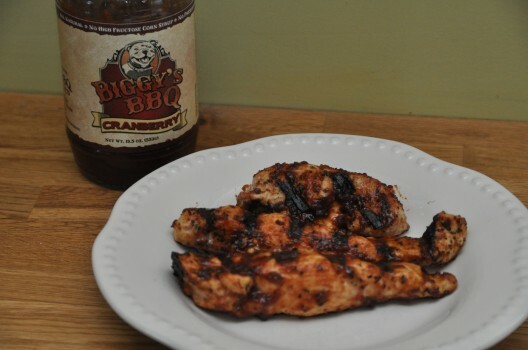 So let’s see how Biggy’s BBQ Cranberry barbecue sauce fares. 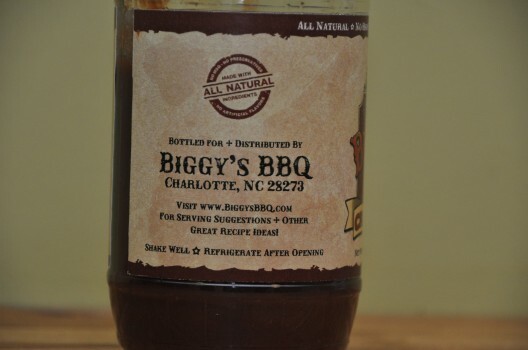 Biggy’s sauce is from Charlotte, NC – a very competitive region in the country to launch a BBQ sauce with a lot of big names players around like Bone Suckin Sauce. What’s required in this market is a very strong label, a very strong product, and something different that stands out. I liked the label, I liked the flavor, and while it’s not doing anything extremely remarkable on the label (except for it being named after a rescued bull terrier Biggy), it has the professional, clean, and descriptive qualities that I look for in a sauce. Opening the bottle I was surprised at the thick, chunky consistency which gives it a real homemade feel. In fact, that would be one of my only criticisms – they could put something on the front about that. 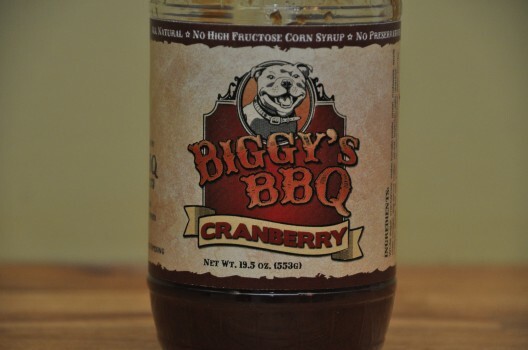 Biggy’s “Homestyle” or “Thick & Chunky” BBQ Sauce. The sauce handled itself well on the standard boneless chicken that I grill for all my reviews – easy to apply and it stayed on throughout the cooking process with ease. The flavor uncooked was a bit strong from the chunks of cranberry and the apple cider vinegar. It almost tasted like BBQ sauce mixed with Ocean Spray’s Cran-Apple. So I didn’t smother the chicken with any extra sauce. But the good news is that when its cooked, everything settles in just perfectly. The sweet and tart cranberries mellow out and merge with the apple cider and almost taste a bit like the right amount of grape jelly merged with a BBQ sauce. You get the sweet, and the salt from the soy sauce, and the balance is just really nice. 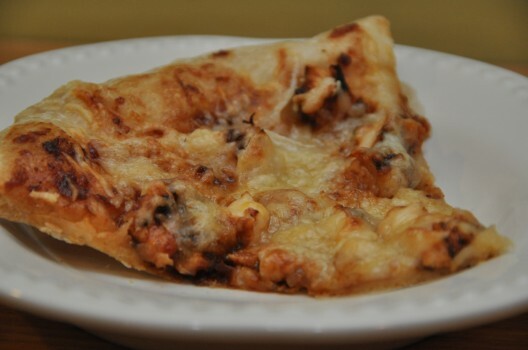 I was inspired to have BBQ Chicken Pizza (I cooked the chicken, and my wife Liz made the pizza) with it. The pizza was a whole wheat crust, the Biggy’s sauce, sweet onion, and mild cheddar cheese. Oh it was so good. My 6 year old daughter and 18 month old boy also loved it. Great execution of a fruit-based sauce. 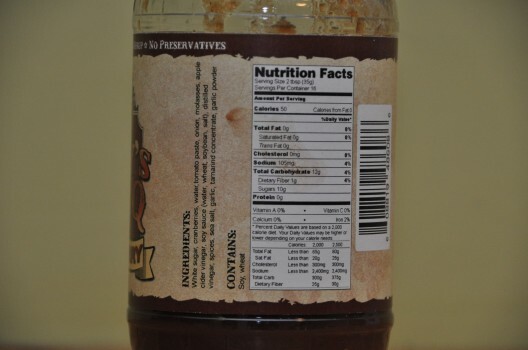 The label accurately paints a picture of the sauce before opening the bottle and tells you what’s in it. It puts cranberry front and center. It simply stresses the most important attributes of the ingredients they selected – All Natural, no HFCS, no preservatives. Things the average shopper might look for and select because it’s easy to see on this label. The taste is great. It’s cranberry alright, but done in the right way. I think it could win sauce competitions in a fruit-based mild category depending on the judges of the day. It goes great with chicken. I’ll try it on smoked turkey next… They could put something like homestyle to stress the thick, chunky, natural consistency. I see they have a Ginger Peach as well, but I’d love to see this company’s take on a traditional KC style sauce sticking by the chunkiness and natural ingredients values that they’ve got here. This stuff is great! I’ve used it at several cookouts, great on pork!